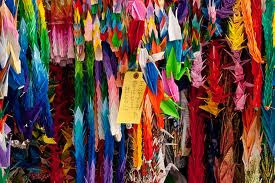 where the paper crane has become a symbol of peace. 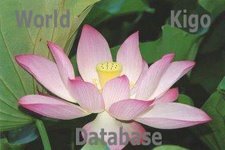 World Origami Days, held each year from October 24–November 11, a 2-1/2 week celebration of the international community of origami!. October 24 is the birthday of Lillian Oppenheimer (1898-1992), who founded the first origami group in America. 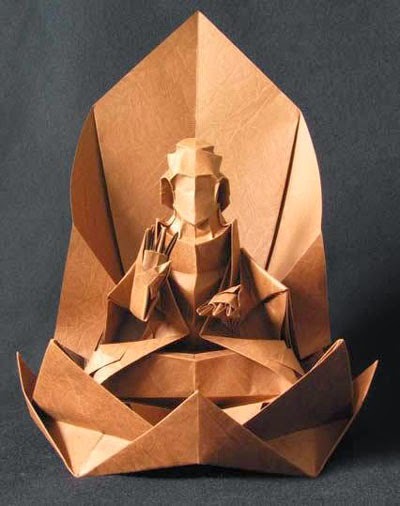 She was also one of the founders of the British Origami Society and OrigamiUSA. Creates a world from simple mould. Bird or Beast or Geometry. 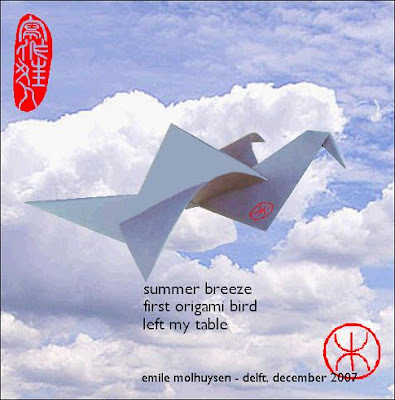 Japanese people love poetry and have handed down poems as well as origami models. 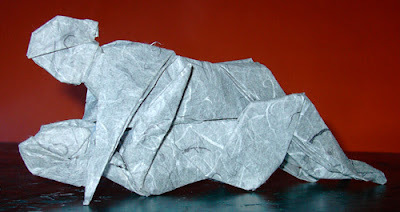 Click on this LINK to see more poems and origami figures. Haiga had been an interest of Mary's since living in Japan for two years. But she had never created one until needing a special wedding anniversary gift. Mary was led to use several of Chuck's published haiku for the first joint work of haiga. 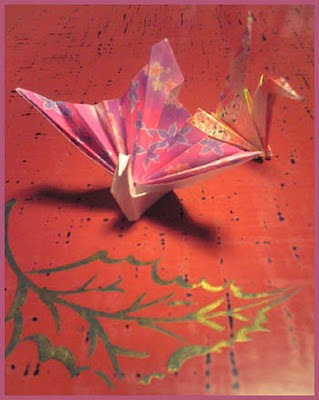 "Origami" is the first phase of an incubation effort known as “Haiku,” which Bill Gates unveiled at WinHEC last April. The concept prototype was developed by Otto Berkes, then an architect and now general manager of the Ultra-Mobile PC team, as an exploration into ideal mobile PC designs. Haiku generated excitement, and Mitchell decided to fund a prototype that was as close to “Haiku” using readily available technology to test product concept and viability. The project proceeded with speed. “Reflecting back, it’s amazing how quickly we went from a pure concept to products in the market,” Berkes said. “It was only about a year ago that [Gates] showed the concept, and now products inspired by that concept are going to be sitting on store shelves.” The Samsung product is expected to be available in April, with the others to follow. 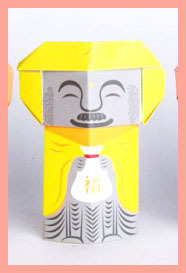 The code name “Origami” will give way to manufacturers’ product names.
. kinun Jizoo 金運地蔵　Kin-Un Jizo for Money . was considered to be the grandmaster of origami. He is credited with raising origami from a craft to a living art. According to his own estimation made in 1989, he created more than 50,000 models, of which only a few hundred designs were diagrammed in his 18 books. Yoshizawa acted as an international cultural ambassador for Japan throughout his career. In 1983, Japanese emperor Hirohito named him to the Order of the Rising Sun, one of highest honors that can be given to a Japanese citizen. there are mountains and valleys . . .
***** . kami 紙 paper art and craft . At the Origami Kaikan you can furnish yourself with everything you might need to create some truly beautiful folded paper objects. Check out what it is possible to make and get inspiration for your own work on the mezzanine exhibition floor. Here you can see some examples of amazing origami such as a wall of flags, each made out of 96 cranes folded from a single sheet of paper, or stunning dolls whose clothes look like silk. The exhibitions change every couple of months and are often focussed around a current festival or event. Kobayashi-sensei is very hands-on in his approach to managing the Origami Kaikan. This stunning book presents detailed instructions for eleven elegant and lifelike paper flower projects that will enhance any home or occasion. Paper flower expert Naomiki Sato starts by showing you how to fold seven types of paper roses using a variety of techniques for four- and five-sided blossoms, along with their stems, thorns and leaves, and how to assemble them. Four equally exciting papercraft projects follow, showing you how to make Japanese Cherry Blossoms, Bellflowers, tropical Plumeria (Frangipani) and Bougainvillea. Each of the eleven projects has detailed step-by-step photographs, diagrams and instructions that make these sophisticated-looking blossoms easy to make even for beginning origami folders. The book includes basic guides to paper and tools, as well as an introduction to basic origami folding techniques for novices.